Former WAFB news director and resident of Baton Rouge for more than 50 years, Carlton Cremeens died Wednesday, Aug. 24, 2011. 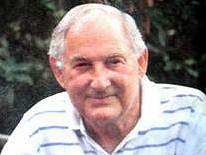 He was born Jan. 6, 1922, in Water Valley, Ark., the son of Orvil Cremeens and Viola Blansett Cremeens. Growing up in the Depression, he, along with many other young Americans, joined the Civilian Conservation Corps at age 16. In 1939, he enlisted in the Navy and saw duty in the Pacific during the entirety of World War II. He was on Okinawa where he participated in the invasion of April 1, 1945. Promoted to chief petty officer, he remained there until the island was secured and the war ended. After his discharge he attended college on the G.I. Bill of Rights at night and worked during the day to support his family. He was married to Helen Johnson Cremeens, and they had two children, John Carlton Cremeens and Paula Yvonne Cremeens Weigel. His wife and children preceded him in death. He retired as news director of WAFB television in 1990, after serving 30 years as news director and anchor. Prior to that, he served as news director of both television and radio stations in Little Rock, Ark. He was a nationally published writer. His highly acclaimed interview with famed and enigmatic Southern author Walker Percy was published in three books and used in several university courses. He is survived by four grandchildren, Lyndsey Cremeens Fontenot and husband Daniel, Matthew Carlton Cremeens and wife Kristi, Joshua Lane Weigel and Joseph Paul Weigel; and four great-grandchildren, Brycelyn Grace, Presleigh Keelyn, Kennan Jack and Adler Joseph Fontenot. He is also survived by his brother, Bill; and Bill's sons, Don, Guy and Gary; his sister, Yvonne and her husband, all of Arkansas. Visitation at Greenoaks Funeral Home, 9595 Florida Blvd., Friday, Aug. 26, from 5 p.m. to 9 p.m. and Saturday from 10 a.m. until funeral service at 2 p.m. Interment will follow in Greenoaks Memorial Park. Leading the service will be his nephew, Gary Cremeens. His grandsons will play his favorite guitar music. Pallbearers will be his three grandsons, grandson-in-law, Daniel Fontenot, Mike Graham, Joe Blanchard, Ted Stockwell and Mike Zobrist.